Hey guys! Welcome to our Demon Hunter’s The Shadow’s Mantle Set Dungeon Guide. Here we will talk about what build to use, skills, items, notes, map and more! Chemical Burn is a MUST HAVE rune – trust me. While many skills are really optional, there’s nothing you really need. DO NOT go with Dawn + Vengeance! the random shots will lead to unnecessary kills. So many irrelevant items? YES – it’s easy to reach minimum “power”. Support the site through Patreon/BRGMedia! Where is the Shadow’s Mantle Set Dungeon? It’s right before Malthael’s room! Teleport to waypoint ACT V – Pandemonium Fortress L2. Make the long and familiar trek to Pandemonium Fortress L3. 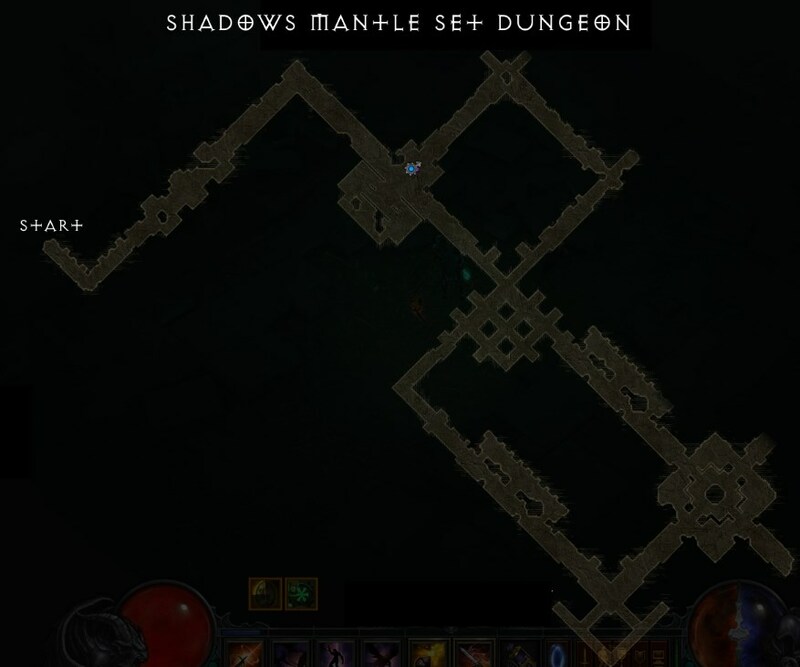 Shadow’s Mantle Set dungeon entrance is right there, as you zone in! 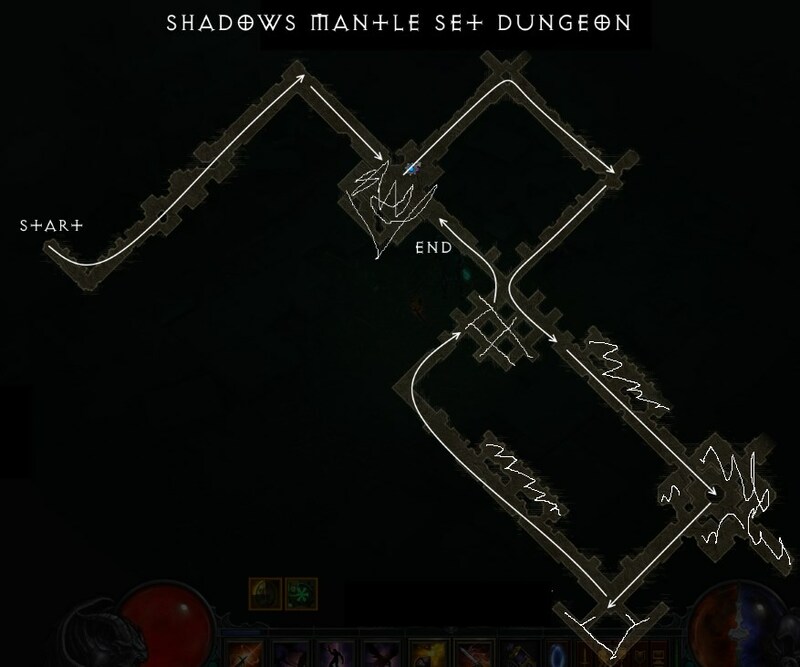 The Shadow’s Mantle Set Dungeon Map / Layout? Impale Set Dungeon is a challenge but fun. It’s a mix of precision, strategy and speed. Start! You’ll eventually reach a room. Clear this now or at the end, doesn’t matter. Head UP and clear that square hallway, best to clear this now. Go down-right and clear that looooooooong rectangle. This is the main chunk! Finish off by clearing that waffle thing, and returning to the first room! Honestly, the first few tries felt hard but after a few attempts I felt like I couldn’t fail at all! So 99% of your stress comes from this objective. First let’s take a look at some of the facts surrounding this objective. Only counts Impale bonus damage – Ricochet doesn’t count. Hitting a guy twice (if the elite lives) also doesn’t count and BREAKS the streak. SKELETONS WITH SHIELD do not count. If you break the shield and hit – streak is gone. Impaling the air breaks the streak. That being said, misclicks will be your greatest enemy in this dungeon. BE PATIENT! Why Chemical Burn rune? The burn from the dagger breaks then kills shield skeletons with one hit. This is a massive time saver of having to break the shield by other means. It also synergizes with Cindercoat. REMOVE AREA DAMAGE from all your gear and paragon. Why? Guys dying off area damage have a slight delay and your dagger may find nothing if AD kills ’em. DISMISS YOUR FOLLOWER… sudden enemy changes in direction, CC and other things… they’re more harm than they’re worth in this dungeon TRUST ME. Envious Blade pretty much ensures a one hit kill. IF THE ELITE SURVIVES AN IMPALE – you’re likely too weak for this dungeon (If that’s even possible). This objective is easy but easily misunderstood. Weirdly, only the INITIAL SLOW UPON SHADOW POWER ACTIVATION is counted towards the objective. It’s more of a Discipline sink if anything else. Not challenging whatsoever, and should only be a minor annoyance. Get this out of the way asap since it ruins your movement rhythm. It should be done way before the half point. Cindercoat + Chemical Burn is a nice reduction of costs right here. Zodiac + Preparation-Punishment is a classic trick. Bat gives us a tiny boost. Blood Vengeance! and optionally, Reaper’s Wraps! Given all these measures, Hatred may STILL seem low. You can stand around and spam our generator (Grenade) for this purpose – as an emergency. While you may be tempted to use the Vengeance-Seethe + Dawn combo – I advise against it! Vengeance causes too many unnecessary deaths. The Cleaning up Phase – expect to fail this dungeon once or twice once you enter the cleanup phase! It can be a bit annoying. WARPING DUDES are your worst enemy (You know what I’m talking about). I’m pretty sure they appear in packs of 2-3, so if you see one try to take extra care in making sure they’re all gone. They also cause you to miss your Impales so again – PATIENCE. Once your objectives are complete – RACE to the end. Sadly, this isn’t one of those dungeons that you can backtrack easily, so if you miss some guy across the map – it’s a redo. The Shadow’s Mantle Set Dungeon is damn easy, and hopefully, we helped you even a little bit! The Burst of Wrath can’t be used by Demon Hunters and hence it can’t be in the cube, so are there any other suggestion for this. sorry about that… Kanai’s for this is really irrelevant. just make sure you have Envious Blade, either cubed or in-hand. Instead of Preparation, I leave cubed Dawn+Vengeance (w/ Seethe). Yes, that’s right. After you complete your primary objectives, use Vengeance and impale+vault combo to quickly navigate through the map and finish off the mobs. Especially useful if you have any strays left. yes, this strategy has some merit. Something else that’s important… don’t equip holy point shot… any misses from your extra knives also break the streak.. so with HPS it’s almost impossible. This caused me no end of grief because no-where does it explain what an “impale streak” actually is. The “impale streak” is hitting 5 different enemies successfully in a row. Any misses will cause it to fail, and Ricochet doesn’t count. I haven’t looked into the cold rune to see if that also auto-fails you but it might be an issue. Again DO NOT USE Holy Point Shot. My time keeps running out between 2:20 and 3:30 causing me to fail the dungeon. I am careful not to break the chain very much but have consistently failed with 20-30 monsters left. super frustrating. Any ideas why is time being shorted? did you miss monsters along the way or you can’t complete the whole path? Back in the day, we have 2 minutes left in the dungeon. It sounds like a tall order but try to maximize vault. there is a thin line between speed and precision. If its any consolation, it took me a few tries before I mastered the dungeon. Movespeed and mobility are important. Update me if you can! good luck! What is the prize for finishinh this dungeon? mastering set dungeons is one of the conquests for this season….